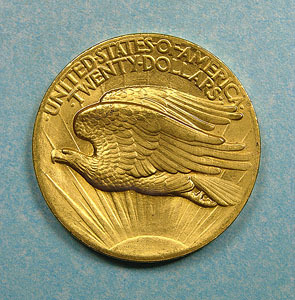 But the $20 Double Eagles, newly redesigned by sculptor Augustus St.-Gaudens at the request of President Theodore Roosevelt, had a terrible flaw, in Jones’ view. 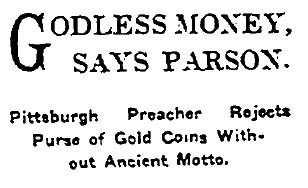 St.-Gaudens died in August before the release of the coins and the resulting furor over omission of the motto, which was restored by U.S. Mint engraver Charles E. Barber in 1908. In fact, St.-Gaudens wanted to omit all the lettering and it was only after a heated battle with Roosevelt that he agreed to restore “E Pluribus Unum” to his design. 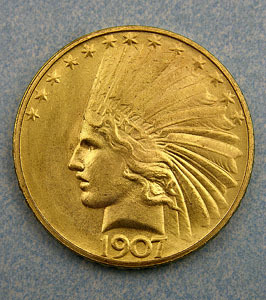 This entry was posted in 1907, 1908, Religion and tagged 1907, 1908, In God We Trust, religion, U.S. mint. Bookmark the permalink.